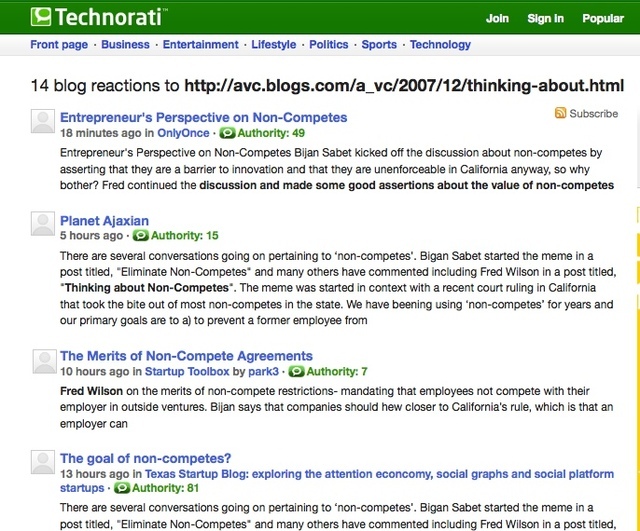 Technorati has been around the blogging world for longer than I have. I remember when I first started blogging, I asked Jeff Jarvis "how do I know if anyone is linking to me?" He told me to type my blog’s URL into technorati. It was one of those "aha moments". I don’t think a day has gone by since then that I have not entered my blog’s URL into technorati. I value comments for sure, they are my favorite form of feedback. But I also really appreciate when someone links to my blog. In fact, those links are often my greatest source of traffic. I include a link to technorati at the bottom of all my posts in case you all want to see who is linking to that specific post. I find that link very useful and I hope you do too. So the news that Technorati is relaunching (again) and is now focusing on bloggers is welcome news. I certainly want to see technorati succeed. But as everyone knows, technorati has been a maddening service to use. In the early days of my experience with technorati, many times I’d get an error message when I tried to access the service. For the most part, they have fixed that problem. But I still get flakey behavior every now and then. But what’s worse is the ever changing UI. Every time I figure out exactly how to get what I need out of the service, they change it. The most recent UI was the worst. I had no idea how to use the service after they made that change. One thing that is a big pet peeve for me is the lack of a direct link to the blog post that is linking to me. Check out this screenshot. This is the technorati result for my post on non-competes on monday. Look at the second post, the one from Planet Ajaxian. There is no link to the post. The links takes you to Technorati’s page for that blog. From there, it’s hard to find the link to the blog itself, and from there you need to scroll around to find the post. I never used to have this problem with Technorati. Now it happens all the time. What did they do to the service to make this happen? Are they doing this to get more traffic to technorati? I can understand the desire to do that. It’s hard to monetize a single result page and then the user is gone. But unfortunately, that’s what I expect from technorati and what they’ve been giving me for years. If technorati wants to focus on bloggers, my first suggestion is to focus on these pages, the result pages for searches on blog URL’s and post URL’s. They can do a lot on these pages that they are not doing. Today I go to sitemeter, feedburner, google analytics, technorati, and a few other places to find out what’s going on my blog. Maybe technorati should use the apis from those other services to create a single page where I can see everything that’s going on my blog today. That would be useful. Finally, a plea for bringing back the dynamic Technorati feed flare. It used to be that the technorati link at the bottom of each and every post on my blog would register the number of technorati links to that post, just like the way the comments link, the digg link, and the delicious link work. That is really useful and would result in me (and others) clicking on that link quite often. Now that it doesn’t display the number of links I click on it a lot less and I am sure others do it. Please fix this technorati and feedburner/google. It’s badly needed.